There really isn't much time to blog this week. Tommy and Sherry arrived here on Monday afternoon with Jay & Madelynn. Anna and Jack were already here. We were glad to see them because we were getting worn out trying to keep up with the 6 & 8 year olds. We took the kids to a playground this morning to help wear them out. They had a ball. My niece Karey joined us with her kids, Kamden and Jack. Last night my parents had us over for dinner. After dinner we cleared off the table and had a rousing game of bingo. My mom had prepared a slew of great prizes that were all wrapped. The kids had a wonderful time. Kamden and Madelynn enjoyed the hot dogs and the jello. The boys played well together. Jay arrived at the cabin with a wardrobe of hats-one for every day. Anna keeps things very interesting and fun. She is showing us how to surf on our ironing board. There is never a dull moment when Anna is around. Anna & Jack are here for a special time with Grandpa & Grandma. We are having a great time but the weather hasn't been very nice. Lots of rain and clouds here. Yesterday the sun finally picked out from the clouds and it warmed up quickly. It wasn't long before they were politely asking if there was any chance of being able to go into the water. I told them it would probably be very cold but they were welcome to try. I went out to test the temperature of the water with them and it was very warm. The water remains shallow for quite a ways out and it was lovely. 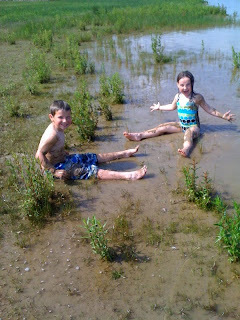 They were having great fun in the water when they discovered that it was fun to cover themselves with mud and then run out and rinse off. I have pictures of their dad doing the same thing thirty years ago. Fun never gets old! We have had a whirlwind of activity the past three weeks. So I'll tell you all about it but it may not flow chronologically. June 11-14 we returned from the cabin to attend the NASCAR race in Brooklyn, MI. I was covering the race for InsiderRacingNews.com. We camped at the Michigan International Speedway campground. It was surprisingly a nice campground. We met some really nice people there and had lots of fun with them. Unbelievably, we camped by them in Branson. Tom had talked with their brother who was traveling with them. We decided that we were really meant to meet them. We hope to spend time with them again. Writing at the racetrack is really hot, hard work but having Tom there made it better. We could meet often during the day. We returned to the cabin on Monday with our oldest granddaughter Madelynn. We're having a good week watching boats, doing crafts and enjoying the sights of the Soo. Tom and I celebrated our 40th wedding anniversary on Sunday. We went to church at Calvary Baptist Church. That is where we were married on June 6, 1970. So we had great fun reliving that very special day. We took some then & now photos. 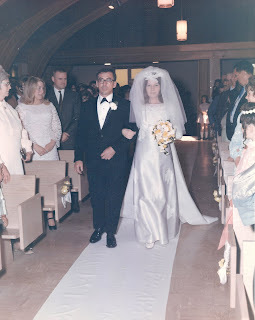 My dad was very teary when he walked me down the aisle. What a blessing to be able to spend my 40th anniversary with my parents. Here is how we look today. There is a story about this picture. My train ripped off my dress when we started to walk back down the aisle. I was so happy that it didn't tear my dress. The front of the church hasn't changed much but those two young kids have! This special picture is Audrey & Wilson Anderson with my folks and Tom & I. Audrey was my mother's maid of honor in 1947. What a blessing to have friends and family for a lifetime. We are at our cabin near Sault Ste. Marie and enjoying a wonderful stretch of weather. The weekend is predicted to be rainy but we've had good working weather this week. Every year when we arrive near the end of May we find the yard and gardens have a big head start on us. The grass grows very fast here because it is damp and needs to be cut more than once a week. The flower gardens are always overrun with weeds. So all week we have been working and trying to get things under control. The yard is coming nicely but the flower beds have a ways to go. The boats are a delight to us again and we take time to watch and note each one. The ship below is the Canadian Coast Guard vessel Griffon. It passed up bound yesterday. I wonder if they are bringing it to the Soo because the US Coast Guard from here sent a large group of men and boats down to work with the oil spill in the Gulf.